The miracle that opened the way to his beatification was the cure of a Florida mother's child still in the womb. Saint Josemaria described him as a person "who loves so much, who is so concerned for the humblest." On Sunday October 19, Pope Francis will beatify one of his predecessors in the closing Mass for the Extraordinary Synod of Bishops on the family, in St. Peter's square. The process of beatification for Giovanni Montini began on May 11, 1993. On May 7, 2014, a miracle attributed to his intercession was approved by the Congregation for the Causes of Saints. The miracle took place in Florida in 2001. Doctors told a mother who was five months pregnant that her child showed evidence of serious health problems and would die in the womb. One doctor advised abortion, but the mother refused. The child's grandmother placed a prayer card with a relic of Paul VI on the mother's womb and prayed for a number of days along with others from her parish. Fifteen weeks later, the child was born without any health problems. This great friend of the family and of human life thus showed that he continues to act. "It was a miracle in accord with the magisterium of Pope Paul VI," said Antonio Marrazzo, postulator of his cause of canonization. "He is telling us that God protects us right from the mother's womb, from the moment of conception. For God human life has a value that cannot be manipulated, a value that God himself gives to it." When he was elected Pope on June 21, 1963, he took the name of Paul to express his desire to spread Christ's message throughout the world. He was the first Pope to visit every continent, and became known as the "travelling Pope." His ten international trips set an example that his successors would continue. He continued and closed the Second Vatican Council that his predecessor, Saint John XXIII, had begun. In the following years, he strove to put into practice the Council's indications. Recalling his arrival in the Eternal City in 1946, Saint Josemaria said that Msgr. Giovanni Montini, then the Substitute Secretary of State, was "the first friendly hand I found here in Rome." "On July 1  he met with Monsignor Montini, the undersecretary of the Secretariat of State. On May 15 Monsignor Montini had written to him, thanking him for the publications Don Alvaro had given him on his behalf and expressing his feelings toward the Work: I have had the great pleasure of learning about the Priestly Society of the Holy Cross and about Opus Dei and, in admiration of the aim they set for their endeavors and the spirit in which they carry them out, have given thanks to the Lord for this favor he has bestowed on the Church in raising up souls engaged in such difficult and important work. What I can do is little, but know that I am always ready to help you in whatever way you may need me to. "After this cordial meeting, Monsignor Montini invited many other officials of the Roman Curia to get to know Father Josemaria. As the Father would later recall, Monsignor Montini's was 'the first friendly hand that I found here in Rome.' By then Don Alvaro had obtained a photograph of the Pope, autographed and with the message: 'To our beloved son Jose Maria Escriva de Balaguer, Founder of the Priestly Society of the Holy Cross and of Opus Dei, with a special blessing. June 28,1946. Pius P. P. XII.'" On November 21, 1965, Pope Paul VI visited Centro ELIS, a social initiative of Opus Dei in Tiburtino, one of Rome's poorest neighborhoods. The Pope stayed well beyond the time planned for the visit. He celebrated Mass, blessed a statue of our Lady for the University of Navarre, and attentively visited the various parts of the Centro ELIS. "Pope Paul enjoyed the visit, recalling how years before, just after the end of the Second World War, he had been passing through Tiburtino when some youths entreated him in the street, 'Give us work! Give us work!' 'What work can you do?' he had asked them. 'Anything ... well, nothing actually,' came the painful answer. "Now he saw that demand fulfilled, and when Monsignor Escriva asked him to bless everyone there in the new buildings, the Pope proposed, 'Let's give the blessing together.' Monsignor Escriva was so moved by the Pope's deference that he dropped to his knees and bowed his head. 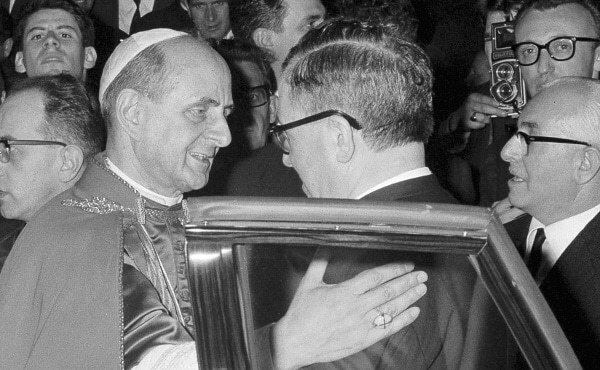 Soon afterwards, as Paul VI was leaving, Monsignor Escriva knelt down once again outside the door on the wet ground – it had been raining – to kiss his ring. But the Pope took hold of his elbows, lifted him up firmly and embraced him, saying, Tutto, tutto qui è Opus Dei! 'Everything here is Opus Dei!'" (Pilar Urbano, The Man of Villa Tevere). 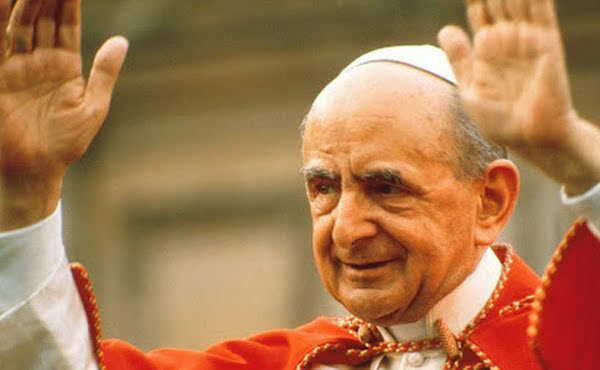 "Paul VI, who yearns so much for peace , who loves so much, who is so concerned for the humblest, and so strongly desires equality in the world, and for an end to poverty, told me through Cardinal Del'Acqua that he wanted to inaugurate Centro ELIS, in Tiburtino, before the Second Vatican Council ended, so that Bishops from all over the world could see how much he loved Opus Dei and people who need a better standard of living, who have rights but have no way of exercising those rights" (Saint Josemaria Escriva, speaking at a gathering in Tajamar, Madrid, on October 1, 1967. Quoted in Antes, mas y major, Lazaro Linares, p. 163). 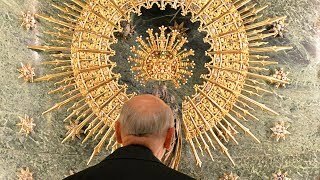 "On January 24, 1964, the Holy Father Paul VI received the Founder of Opus Dei in a private audience. When Msgr Escriva entered the room he started to kneel down to greet the Pope, as the current protocol required. But Pope Paul would not let him: he came forward and, opening wide his arms, gave him an affectionate welcoming embrace. 'Only eighteen, Your Holiness,' replied Don Alvaro. 'In that time I've become old,' said the Pope. 'Oh, no, Your Holiness: you've become Peter!'" 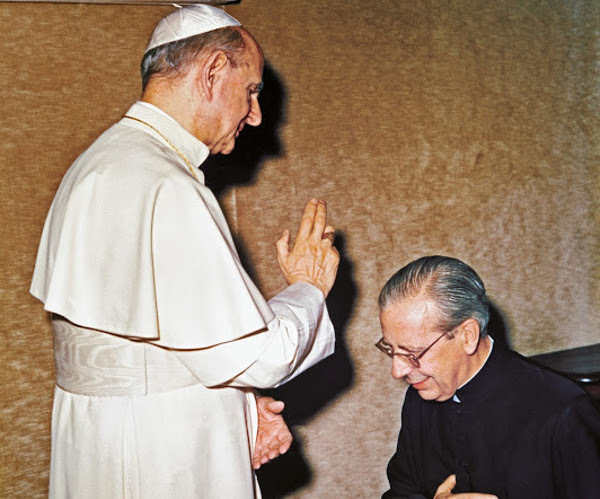 Blessed Alvaro recalled a visit to Paul VI soon after succeeding Saint Josemaria at the head of Opus Dei. The Roman Pontiff received him standing, leaning on his work desk. He raised his arms and greeted him very warmly. "Holiness," said Don Alvaro," I am very grateful for your greeting, but I would like to ask the Holy Father to be kind enough to grant me his Apostolic Blessing and his prayers. For I am the successor to a saint, and that's not at all easy." And Paul VI replied: "Now the saint is in Heaven, and from there he will help the Work go forward."